All canine professionals should be comfortable working with dogs in a hands-on capacity. Their skill set should include basic obedience, operant conditioning training techniques, and handling. The body language of a dog can help a handler anticipate changes in its behavior. Canine handlers must pay careful attention to a dog’s ears, teeth, posture, and general expression. The dog’s behavior can indicate signs of aggression, fear, distraction, or happiness. Grooming can be a critical part of canine care, particularly for long-haired breeds. All dog handlers should be able to handle the basics such as removing mats, brushing out long hair, trimming nails, and cleaning ears. The ability to use clippers and style dogs into breed-specific cuts is a plus for those in the dog show industry, and it is mandatory for those working within the grooming industry. Proper grooming is essential to maintain canine health, and the close observation of the dog during the grooming process can help the handler detect developing health issues at an early stage. Dog handlers should have an understanding of basic canine health issues, particularly those that are frequently observed in the breed(s) they work with. It is also important that handlers note subtle changes in each dog’s behavior or eating habits that could indicate a developing problem. Individuals working with dogs should also be able to provide basic care such as cleaning a wound, removing fleas and ticks, and giving oral medications. Those working specifically in canine health career paths (such as veterinary technician roles) should be able to give injections, collect blood or other body fluid samples, and perform more advanced medical treatments. Canine professionals should have a basic knowledge of canine anatomy as well as a general understanding of the qualities that are valued in each breed with which they work. This is particularly important for dog show judges, dog show handlers, breeders, and trainers. All canine handlers should have the ability to communicate clearly with other animal professionals that they may work with (such as veterinarians, groomers, trainers, and breeders) to ensure that the needs of the dogs are met at all times. Several canine related professions offer certification programs that can greatly enhance a candidate’s skill set and knowledge. If these certifications are relevant and appropriate to a specific career path, they should always be considered. 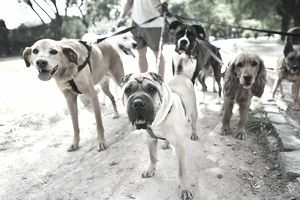 There are many such certification programs for dog groomers, dog trainers, behaviorists, canine massage therapists, and various pet caregiver career paths. Achievement of these certifications can enhance a candidate’s professional credentials and can also increase their earning potential. Patience is perhaps the most important quality for someone who wants to work with dogs professionally. Most canine careers require a great deal of patience, as it can take a significant amount of time to get a dog to exhibit the behaviors that the handler desires. (Of course, patience is an asset for those working with animals in any capacity, not just those working in canine fields).